Eden Smith was undoubtedly the most consistent Arts and Crafts architect in Toronto during the late nineteenth and early twentieth centuries. There were other Toronto firms, such as Chadwick and Becket, who were influenced by Arts and Crafts mannerisms for a time, but Eden Smith was the only one who not only adhered to the principles throughout his career but defended them vigorously in public debate. Smith's uniqueness lies in the way he adapted English Arts and Crafts principles to Toronto's climatic and social conditions. 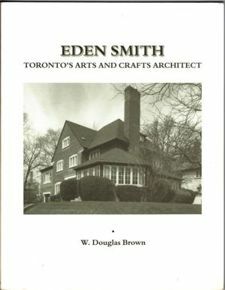 Author W. Douglas Brown has written this book to set the record straight about Eden Smith including his family background, which has been misrepresented elsewhere; Smith's relationship to William Morris and his circle, which was previously unknown; and to provide a reliable inventory of his work in Toronto. W. Douglas Brown originally published his book in 2003. It's now available to you complete free of charge. » View the table of contents and download the book free.